There’s no real surprise to see the 75mm f1.8 head this category but with a rather narrow field of view (it’s the equivalent to a 150mm f1.8) and a hefty $899 ticket, it may not suit everyone. Nevertheless, it’s a top-drawer lens with good center sharpness at the initial aperture that improves across the frame when stopped down. A 7P-Mpix peak sharpness score is on the low side compared with previous cameras, but that can be attributed to the AA filter on the GX7. Similarly the 45mm f1.8 has good sharpness at full aperture, but it’s still lower than expected on the GX7. Stopping down improves sharpness but at $389 this compact and lightweight lens is particularly well suited to the small MFT bodies. It has low vignetting and has excellent control of chromatic aberration, almost as low as the 75mm. At $239, the Sigma 60mm f2.8 DN A could also be consider a little ‘long’ for a portrait lens but it performs very well indeed, with similar sharpness at f2.8 as both the 75mm and 45mm. Although the maximum aperture is moderate in speed, the GX7’s stabilized sensor will help reduce camera shake in low light. Vignetting is low and so is CA, though it’s not at the same level as the Olympus models. 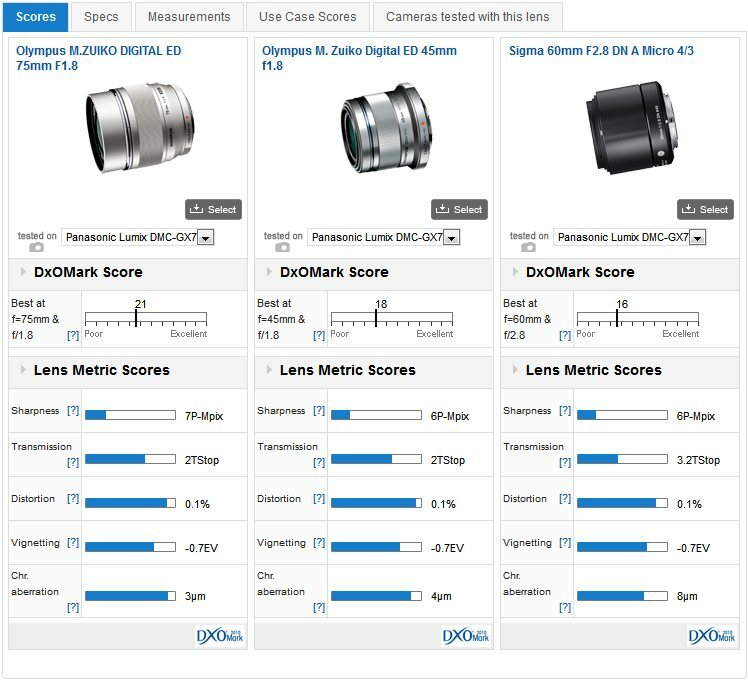 Keep in mind that while the GX7 has in-camera correction when outputting JPEGs and supplies that data with Raw files for auto-correction with certain software utilities, support for any brand other than their own isn’t guaranteed. Comparing all three models at f2.8 on the GX7, the Sigma 60mm is close in sharpness to the 75mm and has superior uniformity to the 45mm. The best performing model in this category is the Panasonic made Leica Summilux 25mm f1.4. 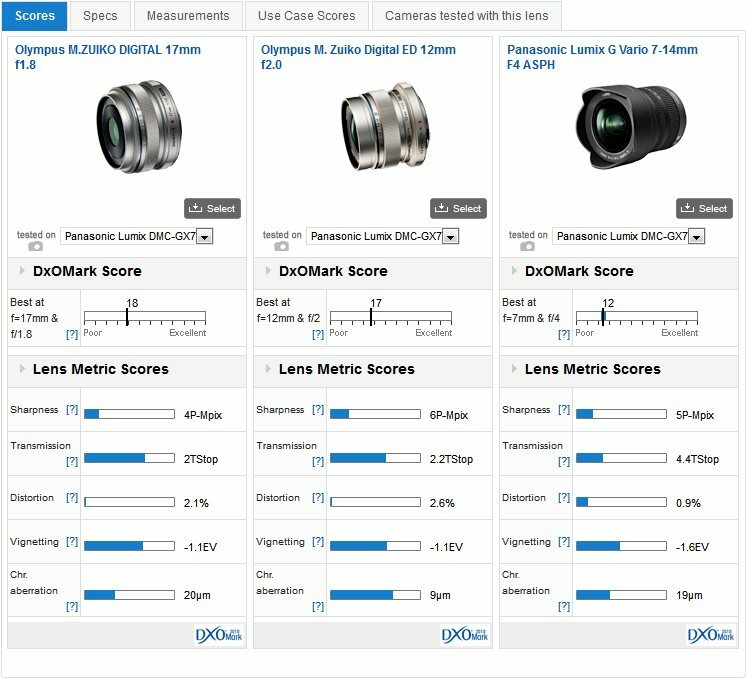 With the highest DxOMark score, it’s the best-corrected standard lens overall but peak sharpness is at the same level as the 20mm and it is prone to high levels of CA. From the company’s view the 25mm and 20mm complement each other nicely. Where as the Leica lens is quite large (for this format) the 20mm f1.7 ‘pancake’ is considerably smaller and lighter. It has good center sharpness but it lacks the Leica’s uniformity and has lower corner sharpness. Nevertheless it’s modestly priced, with a saving of around $180 compared to the 25mm. In third place, the Sigma 30mm f2.8 has only a moderate maximum aperture but image quality isn’t quite as high as you might expect. 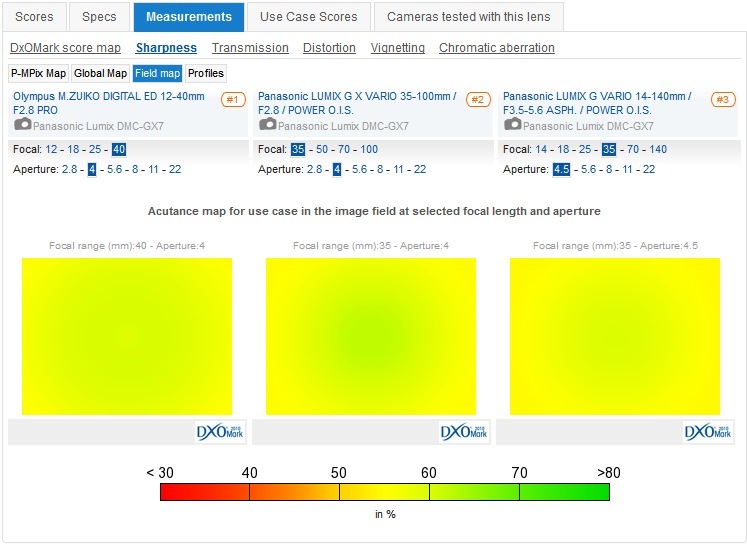 While the maximum aperture has good uniformity, peak performance is at f4. 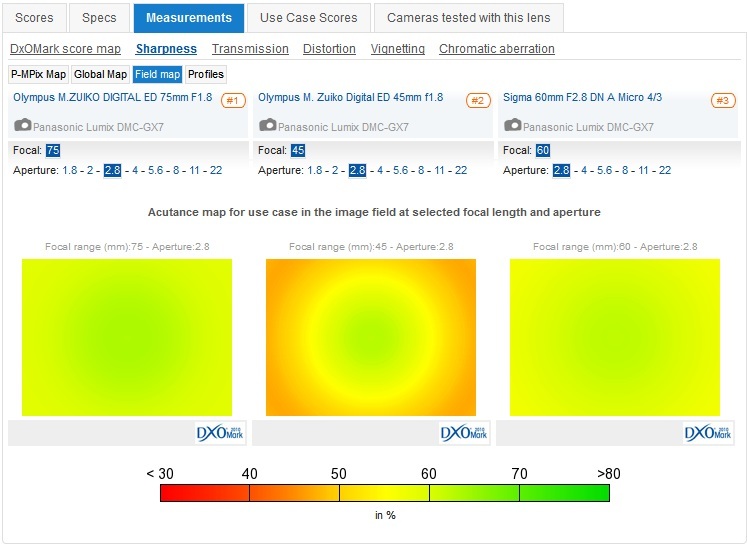 Distortion and vignetting are low as you might expect from a lens with a large (APS-C size) image circle, however, chromatic aberration is very high. Overall, it’s not quite as tempting as the other two in this category, but at $199 the Sigma is accessibly priced. Sharpness and uniformity improves when stopped on both the Leica 25mm and the Panasonic 20mm while Sigma performs best at f2.8 to f4. 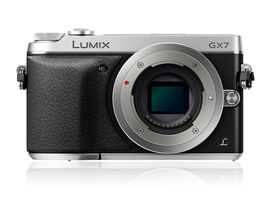 Due to the extraordinary Lumix G Vario 7-14mm f4 ASPH, wide-angle prime choices for loyal Panasonic users are a bit slim. They make a 14mm f2.5 ‘pancake’, which sounds promising but we’ve yet to analyze it. Olympus on the hand has several models. Even though the Olympus 17mm f1.8 heads this category, as a moderate wide-angle 35mm equivalent, you might expect it to have higher peak sharpness. It is somewhat disappointing on the GX7 but, on the plus side, it has good uniformity from the initial aperture throughout the range. The 17mm f1.8 is also fast to focus and is also rather well made, while the mechanical manual focus ring is a nice option to have during video capture. The 12mm f2.0 has the same construction and benefits with video and while it only narrowly just misses out on the top spot it has, in fact, higher peak sharpness, albeit not the uniformity of the 17mm. It performs well in other areas too. It has low distortion and good control of lateral chromatic aberration. Vignetting is also low for a fast-wide-angle lens this. As you may expect, the 7-14mm f4.0 zoom can’t match the primes in image quality, but it makes a good choice. At 12mm it can’t quite match the Olympus in sharpness but most of the gains of the prime are in the outer field. Like many zooms, the 7-14mm actually performs best at the wider end, or least it’s sharper at 7mm than at 14mm. At the shorter focal lengths it has more chromatic aberration, heavier vignetting and more noticeable distortion but, even then, given the range of focal lengths it’s a versatile lens and well worth considering. Panasonic and Olympus offer some good wide-angle choices, and at 12mm the 7-14mm f4 zoom isn’t far behind the M.Zuiko 12mm at f4-5.6 in the center though it can’t compete in uniformity. 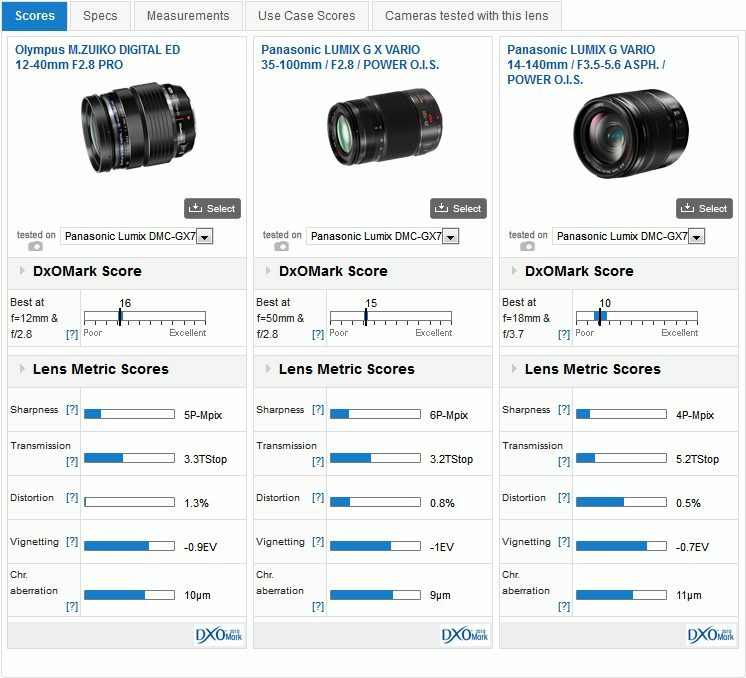 The new Olympus 12-40mm f2.8 is the best performing zoom in this particular category but the rival 12-35mm model from Panasonic is very close overall. The Olympus doesn’t have stabilization built-in but then it’s not really needed on the GX7 and it’s around $130 cheaper. 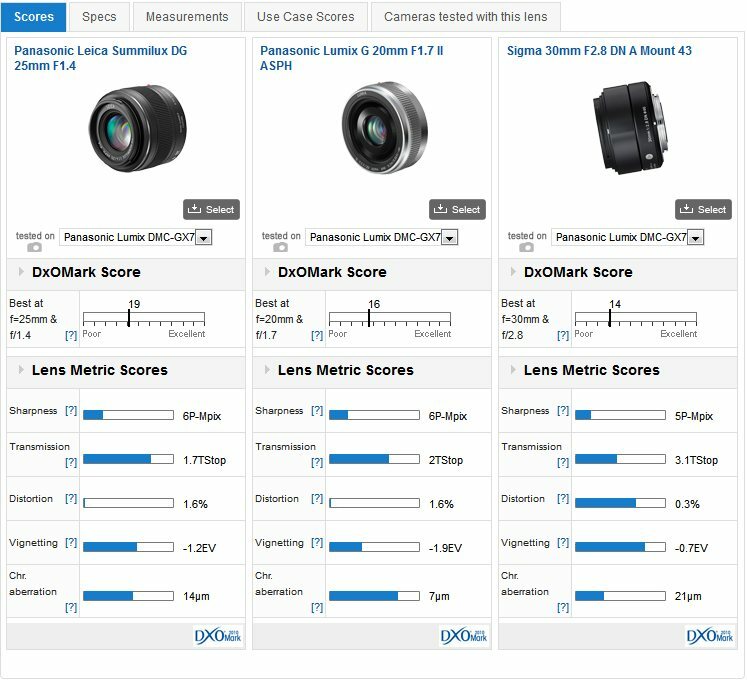 Like others in this round-up peak sharpness is somewhat disappointing when comparing the same lenses on rival bodies, but it appears Panasonic has been overly cautious. The 12-40mm remains our choice as the best performing high-speed standard zoom, closely followed by the Panasonic. 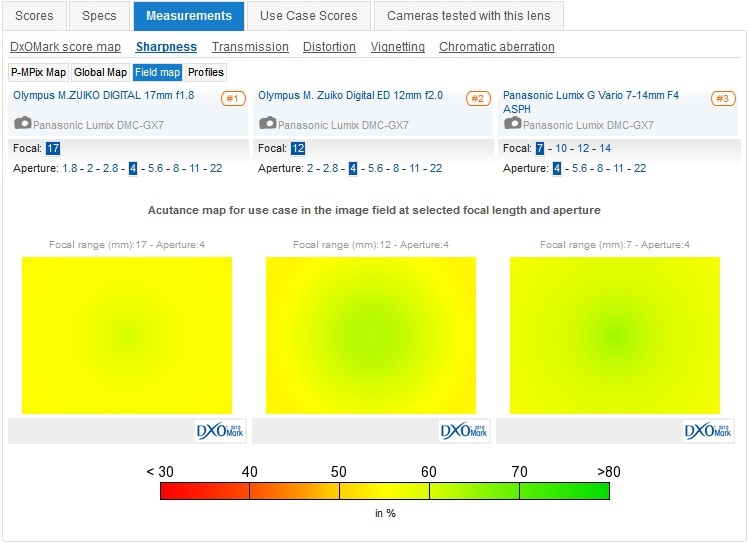 Either of those would complement the Panasonic 35-100mm f2.8, which occupies second place in overall IQ in this group. It’s a very strong performer but keep in mind it’s sharper at the shorter end of the zoom range. Wide-open at 100mm it’s a little disappointing but this improves considerably at f4. 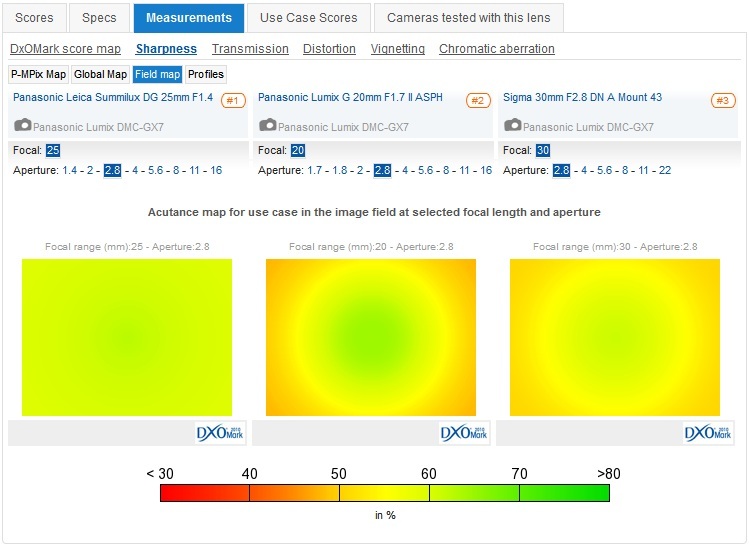 In fact, peak sharpness is achieved at f4 throughout the zoom range. Distortion, vignetting and chromatic aberration are all low, but at $1,300 it’s intended for serious use. Our third choice, based on practically, is the recently updated Panasonic 14-140mm f3.5-5.6. Its predecessor was very popular with filmmakers and photographers alike, and the new model is likely to be even more so. As well as being parfocal it has a slightly faster maximum aperture (albeit still variable) as well as featuring the firm’s latest stabilizer technology. Better still, it has improved image quality and for only a small premium over the original. It’s not inexpensive at $920, but it’s quite a good performer throughout the range, at least in the centers and has lower CA and vignetting than some of the primes. At f4 at around 40mm they all appear to perform similarly though peak sharpness is achieved at the shorter end of the zoom range. If you have a Panasonic Lumix DMC-GX7 and a favorite lens, we would very much like to hear from you. Please leave a comment below, stating what lens it is and why you like it.